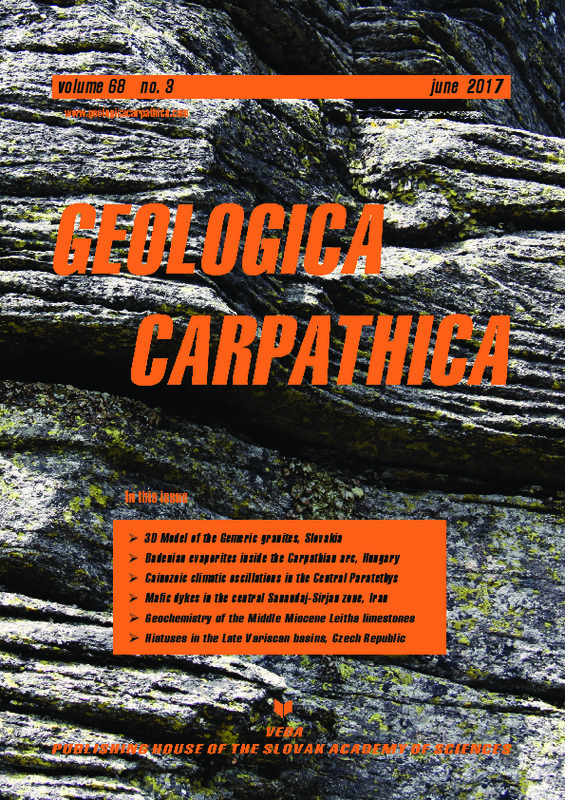 Abstract: Mineralogical, major, minor, REE and trace element analyses of rock samples were performed on Middle Miocene limestones (Leitha limestones, Badenian) collected from four localities from Austria (Mannersdorf, Wöllersdorf, Kummer and Rosenberg quarries) and the Fertőrákos quarry in Hungary. Impure to pure limestones (i.e. limited by Al2O3 contents above or below 0.43 wt. %) were tested to evaluate the applicability of various geochemical proxies and indices in regard to provenance and palaeoenvironmental interpretations. Pure and impure limestones from Mannersdorf and Wöllersdorf (southern Vienna Basin) show signs of detrital input (REEs = 27.6 ± 9.8 ppm, Ce anomaly = 0.95 ± 0.1 and the presence of quartz, muscovite and clay minerals in impure limestones) and diagenetic influence (low contents of, e.g., Sr = 221 ± 49 ppm, Na is not detected, Ba = 15.6 ± 8.8 ppm in pure limestones). Thus, in both limestones the reconstruction of original sedimentary palaeoenvironments by geochemistry is hampered. The Kummer and Fertőrákos (Eisenstadt–Sopron Basin) comprise pure limestones (e.g., averages Sr = 571 ± 139 ppm, Na = 213 ± 56 ppm, Ba = 21 ± 4 ppm, REEs = 16 ± 3 ppm and Ce anomaly = 0.62 ± 0.05 and composed predominantly of calcite) exhibiting negligible diagenesis. Deposition under a shallow-water, well oxygenated to intermittent dysoxic marine environment can be reconstructed. Pure to impure limestones at Rosenberg–Retznei (Styrian Basin) are affected to some extent by detrital input and volcano-siliciclastic admixture. The Leitha limestones at Rosenberg have the least diagenetic influence among the studied localities (i.e. averages Sr = 1271 ± 261 ppm, Na = 315 ± 195 ppm, Ba = 32 ± 15 ppm, REEs = 9.8 ± 4.2 ppm and Ce anomaly = 0.77 ± 0.1 and consist of calcite, minor dolomite and quartz). The siliciclastic sources are characterized by immobile elemental ratios (i.e. La/Sc and Th/Co) which apply not only for the siliciclastics, but also for marls and impure limestones. At Mannersdorf the detrital input source varies between intermediate to silicic igneous rocks, while in Kummer and Rosenberg the source is solely silicic igneous rocks. The Chemical Index of Alteration (CIA) is only applicable in the shale-contaminated impure limestones. CIA values of the Leitha limestones from Mannersdorf indicate a gradual transition from warm to temperate palaeoclimate within the limestone succession of the Badenian.